D’oyleys or Doilies. When I hear this word, I picture an object that is white, round, lacey and decorative; however, I came across the following definition of doilies in a book published in 1845: “These are small napkins intended for wiping the fingers after eating fruit, and are placed round the table for that purpose. They are generally of coloured cotton with a border; the colours are dark, that the stains may not be conspicuous on them” (p. 256, The House Book, by Miss Leslie, Eighth Edition, 1845). Tidies. As far as I can tell, this was a fairly generic term used to describe things like placemats, table runners, and smaller fabric pieces to protect trays and tables from getting dirty. Fish Napkins. Many of the knitting books of the era differentiate between a basket napkin and a fish napkin without further description, so I think it is safe to assume that everyone would know what a fish napkin was as it was a common household item. In the book Savory Suppers and Fashionable Feasts: Dining in Victorian America (1996) Susan Williams writes that “the napkin could be used to remove unfortunate grease from one’s lips, to cover the mouth during removal of a fish bone or fruit pit, or to wipe the juice of pared fruit from the fingers …” (p.43). Perhaps a fish napkin was the name for a specific type of napkin provided when fish was served and used to discretely remove fish bones? Conversely, according to The Workwoman’s Guide (A Lady, 2nd Edition, 1840), “napkins are often used to lay under fish, pastry or sweet things” (p. 184). From this description, it seems that a fish napkin may simply be the napkin laid under fish when it is served. I’m assuming this would have been a dried fish of some sort as I expect that the napkins would have been pretty greasy but maybe they were intended to catch the grease? Armed with this knowledge, such as it is, I am ready to embark on the first pattern in the series and the 25th pattern in Miss Lambert’s book: The Leaf and Trellis Pattern. This is a pattern that has been worked up by others, such as here on Ravelry. There is another pattern by Jane Sowerby that makes use of a later variation on the Leaf and Trellis stitch pattern from 1886, here. At least I have an idea of what it should look like when I set out. 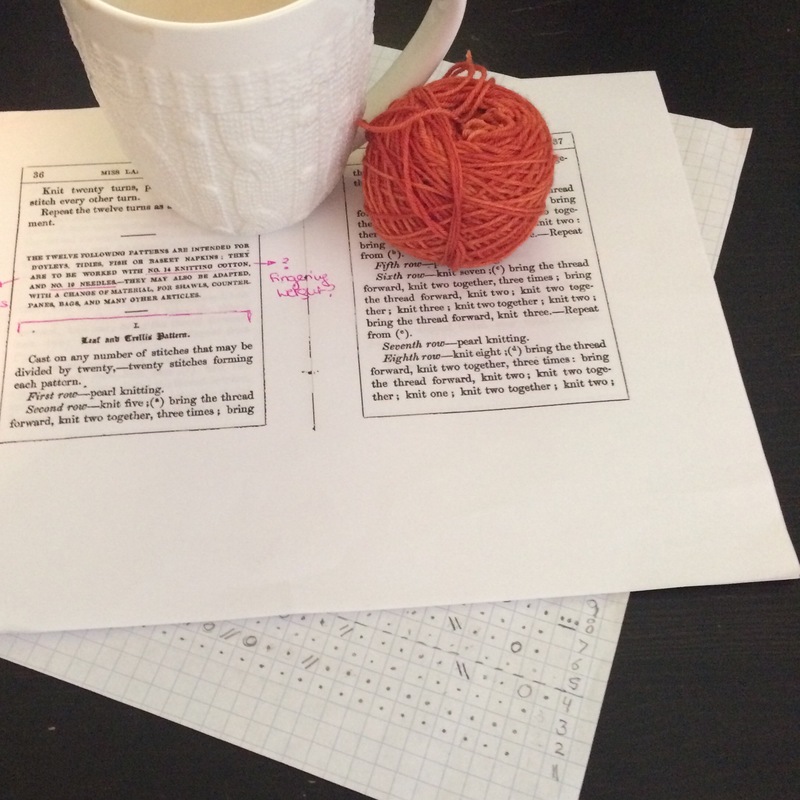 Wish me luck as I finish charting out the pattern and get started! 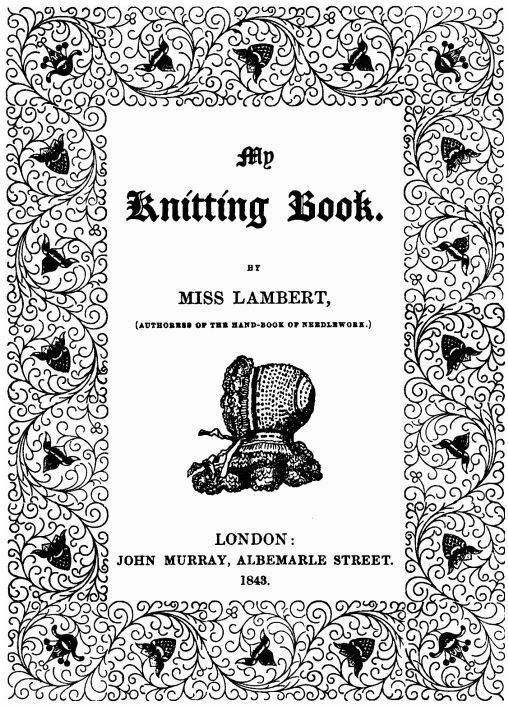 Do you know anyone who is interested in historical knitting? Please share this post! Looking forward to see how it turns out! Good luck!